When placing Buttonhole Attachment back into box, after use, set Bight Adjuster "L" at widest width No. 6. Insert 1-1/16 inch Template into attachment and turn Plastic Adjusting Knob "E" until Cloth Clamp "F" has been moved back and attachment is at its shortest over-all position. The possession of a Buttonhole Attachment is one luxury which is also an economy and sewing becomes a fascination anticipating the simplicity with which buttonholes can now be worked. You merely stitch and yet produce the very nicest buttonholes on a great variety of fabrics. There is no skill required. Your attachment furnishes the magic fingers which produce buttonholes in a fraction of the time it takes to work them by hand. They are more durable and stitches are more evenly spaced than those made by hand. The Buttonhole Attachment is practically automatic since with each bight setting the space is made correctly for all of its six settings. 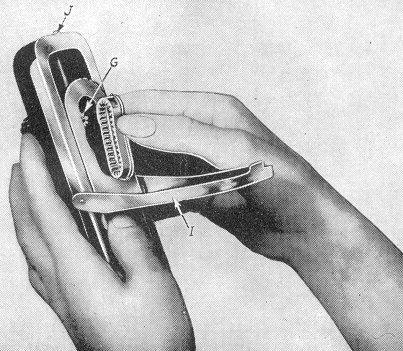 No longer necessary to set attachment for stitches to the inch. No longer necessary to set and try the bight. ONLY ONE SETTING THAT COVERS THREE. Refer to letters on illustrations to become familiar with the parts of Buttonhole Attachment which it is necessary to understand in order to become thoroughly familiar with working a buttonhole. E - PLASTIC ADJUSTING KNOB - Used to adjust Cloth Clamp. F - CLOTH CLAMP - Designed to grip fabric firmly. H - FEED BLADE - Feeds forward and backward. 1 - RETAINER PLATE - Covers and retains Template in place. K - FORK ARM - Straddles the Needle Clamp which actuates movement. L - BIGHT ADJUSTER - Actuates the width of side stitch. N - COVER - Conceals working parts of attachment. 0 - COVER SCREW - Holds Cover in position. 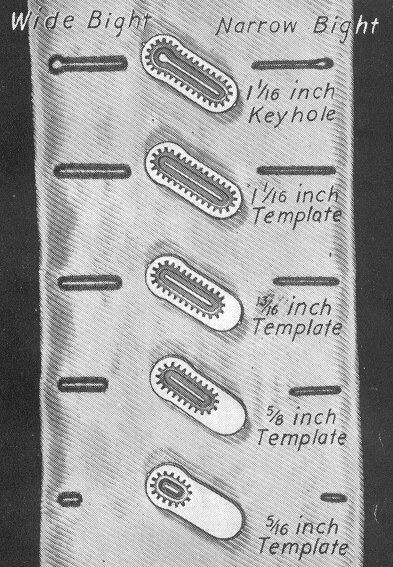 The Templates, referred to as (D) which guide the stitches evenly around entire buttonhole are furnished with Buttonhole Attachment in sizes 5/16", 5/8", 13/16", 1-1/16" with a keyhole shaped Template also 1-1/16" long. Note the illustration of buttonholes and the Templates with which they were worked. To avoid any chance of confusion, in positioning the Templates, they have been designed with a larger rounded end which fits over Pinion Gear (C). To determine the Template required to make the correct size buttonhole for a flat button, place the button over the measurement line on the back of Templates. Make a sample of each size buttonhole and use it as a guide for working buttonholes to be used with irregular buttons. The 1-1/16" Template comes to you enclosed in the Button- hole Attachment. To remove this Template and replace it with another size follow instructions be-low. First turn Plastic Adjusting Knob (E) clockwise until Cloth Clamp (F) is all the way forward toward you, and Pinion Gear G) is at back of Feed Blade (H). 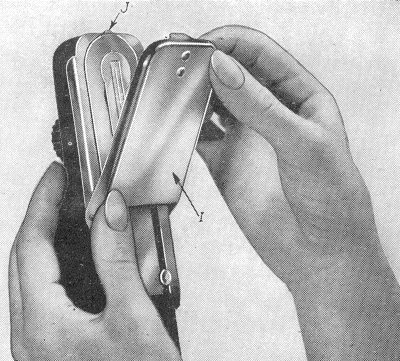 Next turn Buttonhole Attachment bottom side up as shown in illustration. Push the Retainer Plate (1) toward the back by pushing the edge forward with thumb of left hand as illustrated in figure 4. Retainer Plate (1) will be freed from Lock (J) at rear and can then be lowered toward you with the right hand. Illustration 4 shows this clearly. Template (D) is now visible and can be removed easily by rasping it on each side in the curved slot provided. See illustration No. 5. Having selected the Template (D) for size buttonhole desired, insert it in place of the one removed. In doing this gently move Feed Blade (H) side ways until gears mesh, then snap the Retainer Plate (1) back in position. The Buttonhole Attachment is now ready to put on presser bar of machine. Thread Machine as for ordinary stitching. Tensions set for normal stitching can be used, however a slightly snug tension on both bobbin and needle threads makes a more attractive buttonhole. Put in a new straight needle to fit size of thread being used. On. light weight materials, sheer fabrics, or material that has a great deal of elasticity, increase the pressure by lowering the Presser Bar Adjusting Cap Screw several turns. The fabric will then be held more firmly. On material with as much@,, stretch as jersey, place a piece of tarlatan on top of the material so that needle cannot draw it up at center of Cloth Clamp (F). I never use this Feed Cover Plate, I just lower the feed dog teeth all the way under the throat plate so the fabric can slid around well. so ignore the line about how it must be used. Remove Presser Foot and Screw from bar of machine. 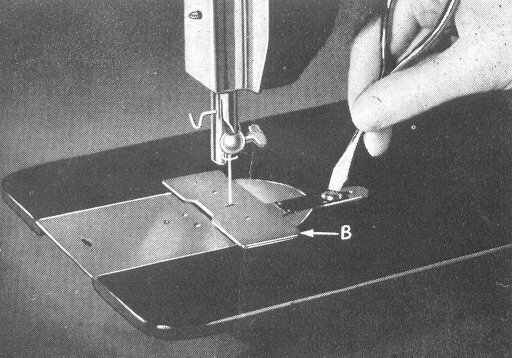 Place Feed Cover Plate (B) over needle plate of machine as shown in illustration No. 6. Allow needle to enter slot in plate making sure it is central from front to back. Fit Anchor Screw through hole in Feed Cover Plate and into screw hole on bed of machine. Fasten securely using a screw driver. This Feed Cover Plate must be used with the Buttonhole Attachment at all times. Position Fork Arm (K) high. Raise machine needle to its highest position. Guide Attachment into position from the rear, fitting Fork Arm (K) around needle clamp while Adaptor (A) is fitted to presser bar of machine. Securely fasten the Attachment to presser bar with the Slotted Clamping Screw (M) using the large Screw Driver. 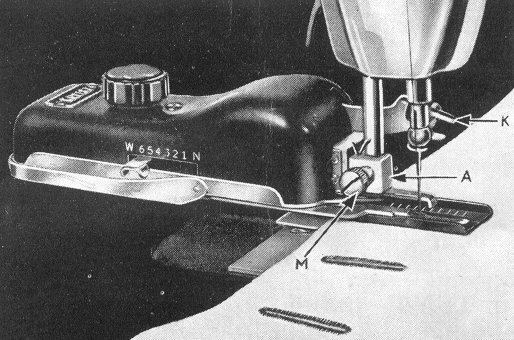 The width of stitch used for working a buttonhole is called the bight, and with each of the six settings provided a correct cutting space is obtained so that ragged edges will be eliminated. Press down on Bight Adjuster (L) and move it to width of bight desired. Backward toward "W" for widest bight. Forward toward "N"' for narrower bights. The different widths are numbered from 1 - 6 on left side of Attachment. The "practice that makes perfect" in all other arts will prove moments well spent to the sewer who strives for perfection. Prepare a piece of material by folding it lengthwise for practising your first set of buttonholes. Baste mark the distance in from edge of material where end of buttonhole is to appear, at the same time, mark the spacing apart of buttonholes. Raise presser bar. Turn Plastic Adjusting Knob (E) clockwise until Cloth Clamp (F) is all the way forward toward you. Place material on which buttonholes are to be worked under Cloth Clamp (F) and place it so that needle enters material at basted marking. Lower Presser Bar. Raise needle out of material at marking, and again turn Plastic Adjusting Knob (E) clockwise until center line on right half of Cloth Clamp (F) is parallel with needle. Hold onto needle thread and take a stitch to bring bobbin thread through fabric to the right side. Hold onto both threads and allow stitching to cover them as right half of buttonhole is being worked. Cut both threads off after a few stitches have fastened them, or hold onto them and encircle entire buttonhole. These threads will act as filler threads giving extra strength to buttonhole. To encircle entire buttonhole allow filler threads to cross front end of buttonhole, traveling up left half and passing them behind needle for the remainder of right half of buttonhole. Allow threads to lap generously at joining. If you desire a more prominent and stronger buttonhole stitch around a second time. Raise presser bar and take work from machine. Draw threads to wrong side to fasten. Threads can be tied or threaded into a hand sewing needle and run through the wrong site of buttonhole. Use buttonhole scissors or small sharply pointed scissors to cut the buttonholes open. Buttonholes should always he long enough to go over the button without stretching. Cut carefully from end to end so that none of the machine stitching will be severed. A razor blade can be used to cut the buttonholes if they are placed over a wooden spool or block. The Buttonhole Attachment has been lubricated at the factory and with normal use will require very little more. However, a drop of Sewing Machine Oil should be placed on the ratchet and pawl about twice a car. To do this oiling it is not necessary to remove the Cover (N). Oil through the opening for Fork Arm (K) in Cover. It is not necessary to remove the Cover (N) to lubricate the Pinion Gear (C) simply lower the Retainer Plate (L) and remove Template (D) as described on pages 6 and 7. Remove Plastic Adjusting Knob (E) by turning it counter-clockwise (spring will adhere to Knob when removed). Remove the screw in front of Knob and carefully remove the Cover (N) to expose the working parts. Apply a small amount of lubricant to parts designated by arrows. Replace Cover (N) by fitting Fork Arm (K) in front opening of Cover (N). Squeeze back of Cover (N) and fit it inside the shoulders of Feed Blade (H). Replace screw and Adjusting Knob (E) and attachment is ready for use. When buttonholes are to be worked on sheer fabrics use a foundation of fine lawn or organdy between the fold of material. Use a separate piece as a foundation under each buttonhole if material is very sheer and foundation gives too much weight to garment. Cambric acts as a good interfacing for woolens and materials that stretch easily. On high pile materials used for coats and suits use a piece of cellophane placed over the buttonhole marking. This will insure a smoother placement under the Cloth Clamp with no danger of teeth of Cloth Clamp catching into threads of coating. When garment has been correctly positioned cellophane can be drawn out before the presser Car is lowered. (The removable cellophane usually carried in your card case or purse calendar is ideal for this purpose.) Slide it over the finished buttonhole when removing the garment from under the Cloth Clamp. Tarlatan placed over materials like jersey or high lustre finishes is helpful in keeping material taut. It is also helpful when elongated buttonholes are required. A buttonhole worked around with a single stitching set at Bight 6 takes on the appearance of a hand worked buttonhole if a second row is stitched with bight reduced to 1 or 2. Start stitching buttonhole at the forward or backward end and keep threads in hand to act as a cording until buttonhole is completed. Dainty embroideries can be accomplished by using the Buttonhole Attachment. With Attachment set for narrow bight fine cord can be covered giving the effect of a raised outline. Scallops can also be embroidered by adjustment of the bight. Scallops can then be outlined with a narrow cording. 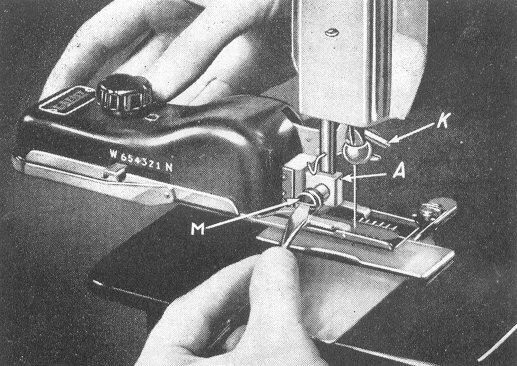 Baste mark garment in the same manner described for producing buttonholes. Turn Plastic Knob (E) clockwise until Cloth Clamp (F) is all th way forward toward you. Place material under Cloth Clamp (F) and guide it so that needle will enter material at basted marking for outer edge of buttonhole. Lower presser bar. Raise needle out of fabric and again turn Plastic Knob (E) clockwise until needle seems to have traveled down the right half of buttonhole (not stitch end, and back on left half of buttonhole until second line from front is reached. Pick up bobbin thread at this point and start stitch- in Stitch up left half of buttonhole, across rear, down right ha@i stopping@ at second line from front directly opposite starting point. Thus the buttonhole at its outer edge is completed and extra length will be added in the following manner. Leave needle in fabric at second line from front edge on right half. Raise presser bar and hold fabric on bed of machine so that it will not shift. Turn Plastic Adjusting Knob (E) clockwise moving Cloth Clamp (F) across front, up entire length at left side, across back and down right half stopping at line that will give the extra length require . Each line on the Cloth Clamp (F) changes the size of buttonhole by 1/8th inch. Therefore, if needle is brought to fifth line from rear a 1 1/2 inch buttonhole will be worked. Lower presser bar and complete stitching the buttonhole. Count lines on right half of Cloth Clamp from the rear when extra length buttonholes are to be worked. Line 1 produces a 2 inch buttonhole. Line 2 produces a 1 7/8 inch buttonhole. Line 3 produces a 1 3/4 inch buttonhole. Line 4 produces a 1 5/8 inch buttonhole. Line 6 produces a 1 3/8 inch buttonhole. Line 7 produces a 1 1/4 inch buttonhole. Line 8 produces a 1 l/8 inch buttonhole.